Imagine going on vacation, leaving behind a dog that doesn’t listen and returning to an obedience-trained pet who is a true companion and a source of pride — a dog that will not only follow your commands but do so in the presence of distractions. That is the essence of Tropical Dog Training’s Board & Train program. But while Board & Train is convenient, many such programs have limited success because one of the challenges they face is transferring control of the dog from the trainer to the owner. Trained dogs respond best to the person who did the training. At Tropical Dog Training, we have developed a method of transferring control that allows you to quickly take command of your trained dog. The dog will be trained by us and listen to you. We will pick up your dog and bring it to our training facility, where your pet will live for three weeks in air-conditioned housing with plenty of playtime and exercise. In addition to standard obedience cues, your dog will learn appropriate behaviors to replace un-wanted behaviors, such as nuisance barking, jumping, chewing, escaping, stealing and pulling on the leash. Upon completion of the three-week training course, we bring your dog home and conduct a lesson to review with you what your dog has learned and what you need to do to maintain the training going forward. With this program, we provide unlimited follow up, so if the dog develops any un-wanted behaviors, we’ll come back and guide you until the problem is solved. 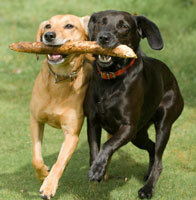 Contact us today, and let us show you how our training program can make your dog a pleasure to own.